Mar 04, 2009 (Congressional Documents and Publications/ContentWorks via COMTEX) -- Tuesday, March 3, 2009 Contact: Michael Amato: (202) 225-6902 Congressman Adam Smith's Statement on the Administration's Announcement to Dispatch Two Senior Officials to Syria Washington DC - Congressman Adam Smith (WA-09), Chairman of the Armed Services Subcommittee on Terrorism, Unconventional Threats and Capabilities, made the following statement after the Obama Administration announced it will dispatch two senior officials to Syria. Congressman Smith recently returned from a trip to Syria where he met with President Bashar al-Assad and discussed a fresh start to relations with Syria. "The Obama administration's announcement to dispatch two senior officials to Syria to begin to initiate dialogue is a positive development and signals a new direction in U.S. relations not just with Syria, but the entire Middle East. After visiting with President Bashar al-Assad a few weeks ago, it was clear that the regime seeks to begin the process of thawing its relationship with the United States and the West. While we clearly have substantial differences, we also have a number of mutual interests in the region and we should begin to discuss all of these issues. Two officials will hold preliminary talks with Damascus in the coming days, the latest signal that the Obama administration intends to engage longtime U.S. rivals. Reporting from Jerusalem — Two U.S. officials are being dispatched to Syria for exploratory talks, Secretary of State Hillary Rodham Clinton said Tuesday, in a new signal of the Obama administration's determination to reach out to longtime adversaries. Clinton, in Jerusalem for her first talks with Israeli officials, described the upcoming meetings with the Syrian government as "preliminary conversations" intended to examine whether Damascus is serious about a new relationship with the United States. She told reporters in a news conference with Israeli Foreign Minister Tzipi Livni that though the outcome is uncertain, "it is a worthwhile effort to go and begin" the talks. The U.S. officials are Jeffrey Feltman, acting U.S. secretary of State for the Middle East who previously served as the ambassador to Lebanon; and Daniel Shapiro, ranking official for the Middle East at the National Security Council, who was a Mideast advisor to the Obama presidential campaign. The two men will leave this weekend for meetings expected to last a few days. They're not expected to meet with Syrian President Bashar Assad, since the talks are preliminary. President Obama, who campaigned on a promise of outreach to long-standing foes, also plans an overture to Iran, and Clinton has appointed a high-level envoy to advise her on U.S. policy toward Tehran. Administration officials see the possibility of a new relationship with Damascus as part of a strategic realignment in the region. A shift could dilute Syria's relationship with Iran, weaken the Syrian-supported Hezbollah and Hamas militant groups, and make it easier for Israel to reach a peace settlement with Palestinians, they believe. Administration officials have sent positive signals to Damascus in their first weeks in office. These include a move to ease export controls and a meeting in Washington between Feltman and Syria's ambassador to the U.S.
At an international conference in Egypt on Monday, Clinton said U.S. officials were interested in "comprehensive" Mideast talks, a signal that the Syrians should be involved. A thaw between Washington and Damascus would reverse the policy of the Bush administration, which withdrew its ambassador to Syria in 2005 after the assassination in Beirut of former Lebanese Prime Minister Rafik Hariri, for which pro-Syrian officials were blamed. But an opening to Syria also poses risks for the United States. In Lebanon, moderate political groups have expressed concern that their interests could be sacrificed by the U.S. effort. For example, they fear the possibility of U.S. compromise on the international tribunal investigating the killing of Hariri, which could ease pressure on Damascus to come clean about the slaying. The Obama administration has sought to reassure Lebanon by supporting its sovereignty and by adding $6 million in support for the tribunal. Israel last year began indirect talks with Syria through Turkish mediators, hoping they would lead to negotiations on a peace treaty. Israeli Prime Minister Ehud Olmert said in December that Syria "wants to reconnect with the West." Israeli Prime Minister-designate Benjamin Netanyahu, who is struggling to form a new government, explored the option of a new relationship with Syria when he was premier in the late 1990s. However, before the most recent elections, Netanyahu declared his opposition to moves that would be at the heart of any deal, such as giving up the Golan Heights, captured from Syria in the 1967 Middle East War. Some experts doubt that Syria would ultimately agree to a deal with the United States. David Schenker, a former Pentagon Mideast expert now at the Washington Institute for Near East Policy, said that ties to the U.S. would mean ending a 30-year bond with Iran that has been a pillar of economic and military support for the Assad government. Clinton exchanged greetings with Syria's foreign minister, Walid Mualem, on the sidelines of the international conference Monday. Clinton's comments Tuesday came on a day when she met with a succession of Israeli officials, including Livni, Netanyahu, Olmert and President Shimon Peres. Netanyahu urged Clinton to set a time limit on Washington's promised diplomatic overture to Iran so the Iranians are not given more time to advance their nuclear program. Iranian officials say they are working to develop civilian energy, but U.S. and Israeli officials, among others, contend that the effort is aimed at building nuclear weapons. Zalman Shoval, foreign affairs chief of Netanyahu's Likud party and a former Israeli ambassador to the U.S., was in the Jerusalem meeting with Clinton and Netanyahu. He said most of the session was spent discussing Iran, Hamas and the Gaza Strip, which the militant group controls, and the need to strengthen the Palestinian Authority, run by Hamas' rival, Fatah. Syria came up, but "not in a significant way," Shoval said. Times staff writer Richard Boudreaux contributed to this report. JERUSALEM (AFP) — The United States will send two envoys to Syria for "preliminary conversations," Secretary of State Hillary Clinton said on Tuesday on a tour to push "aggressive diplomacy" towards Middle East peace. "We are going to be sending two officials to Syria," Clinton said. "It is a worthwhile effort to begin these preliminary conversations. "There are a number of issues we have between Syria and the United States as well as the larger regional concerns that Syria obviously poses." The officials are Jeffrey Feltman, acting assistant secretary of state, and Daniel Shapiro, a senior official from the White House. The pair are currently travelling with Clinton and will leave for Damascus when the secretary leaves Israel on Wednesday. Feltman and Shapiro will "explore with Syria some of these bilateral issues," Clinton said. "We have no way to predict what the future of our relations concerning Syria might be," she said. "We don't engage in discussions for the sake of having conversations. "There has to be a purpose to them, there has to be a perceived benefit for the US." Feltman met the Syrian ambassador in Washington Imad Mustafa in late February in what a State Department spokesman later described as a "very frank discussion." Clinton spoke while on her maiden voyage to the Middle East as secretary of state during which she vowed to aggressively pursue a comprehensive peace plan for the region. "The US is prepared to engage in aggressive diplomacy with all sides in pursuit of a comprehensive settlement that brings peace and security to Israel and its Arab neighbours," Clinton told a press conference in Egypt on Monday. She was there for an international donors' conference on Gaza reconstruction during which she exchanged a few words with her Syrian counterpart Walid Muallem on the sidelines. Clinton stopped in front of Muallem as he stood at the entrance to a banquet room where conference delegates were having lunch, shook his hand and exchanged a few words with him, reporters said. "With respect to talking with the Syrian foreign minister, again I will reiterate that in consultation with our friends and allies, our partners, we are reaching out to determine what, if any, areas of cooperation and engagement are possible," she later told a news conference. Muallem said that the meeting "was short but very pleasant" and that he was "happy it happened." US-Syrian ties were especially tense under president George W. Bush's administration, which accused Damascus of supporting terrorism and of turning a blind eye to the flow of arms and supplies to insurgents in neighbouring Iraq. Relations deteriorated sharply after the February 2005 assassination of Lebanese ex-premier Rafiq Hariri in a Beirut bombing widely blamed on Syria. Damascus has repeatedly denied any involvement. But US President Barack Obama has promised to pursue "principled and sustained" engagement with all Middle Eastern states, including Syria. And earlier this month several leading US Congressmen including Senator John Kerry visited Damascus for talks with President Bashar al-Assad. JERUSALEM | Two senior envoys are about to make the highest-level U.S. visit to Syria in more than four years, a major reversal of Bush administration efforts to isolate the Damascus government. Secretary of State Hillary Rodham Clinton announced Tuesday that Jeffrey Feltman, acting assistant secretary of state for Near East affairs, and Daniel Shapiro, the top Middle East specialist on the White House National Security Council, will travel to Syria after Mrs. Clinton completes her first Middle East trip as secretary later in the week. "We are going to be sending two officials to Syria," Mrs. Clinton told reporters. "There are a number of issues we have between Syria and the United States, as well as the larger regional concerns that Syria obviously poses." Mrs. Clinton said that while she could not predict what might come from the outreach, "it is a worthwhile effort to go and begin these preliminary conversations." She said the decision was made after Sen. John Kerry, Massachusetts Democrat and chairman of the Senate Foreign Relations Committee, visited Damascus last month. The secretary's announcement came two days after the opening of an international tribunal in The Hague to try suspects in the 2005 assassination of former Lebanese Prime Minister Rafik Hariri. Syrian officials have been investigated in the killing. The Bush administration had high-level contacts with Syria during its first term, mainly on the initiative of then-Secretary of State Colin L. Powell and his deputy, Richard L. Armitage, both of whom visited Damascus. It suspended those contacts, however, after Mr. Hariri's assassination and withdrew the U.S. ambassador to Syria. Middle East specialists said the latest move was not surprising, given President Obama's remarks in his inaugural address that Washington was willing to extend a hand to hostile regimes if they "unclench" their fists. "This does not come as a surprise, although it comes a little earlier than expected," said David Schenker, senior fellow at the Washington Institute for Near East Policy. "The Syrians won't be pleased about Feltman [a former U.S. ambassador to Lebanon]. The Lebanese will be nervous, although somewhat reassured that Feltman's the lead interlocutor." Mr. Feltman served in Lebanon during the 2006 war between Israel and Hezbollah. Last year, his embassy convoy was bombed and three Lebanese civilians were killed, including an embassy employee. Syria has allied itself with Iran in recent years and has supported both Hezbollah and the militant Palestinian group Hamas. Western diplomats have expressed hope that those alliances could be broken or at least weakened if Damascus is approached and persuaded that its interests are better served by helping the West. At the same time, Syria took part in indirect talks with Israel mediated by Turkey. The talks ended after Israel began a 22-day offensive in Gaza. Zalman Shoval, a foreign policy aide to presumptive new Israeli Prime Minister Benjamin Netanyahu, said Israel would let the U.S. evaluate Syrian positions before deciding on resuming peace negotiations. On Monday, Mrs. Clinton committed the new administration to seeking a "comprehensive peace between Israel and its Arab neighbors." The Bush administration tended not to use "comprehensive," a code word for peace between Israel and all its remaining Arab adversaries: the Palestinians, Syria and Lebanon. Instead it stressed the Palestinian track and specific issues short of Palestinian statehood, such as security, Palestinian freedom of movement and Jewish settlements in the West Bank. "The U.S. is prepared to engage in aggressive diplomacy with all sides in pursuit of a comprehensive settlement that brings peace and security to Israel and its Arab neighbors," Mrs. Clinton said at a donors' conference for Gaza in Egypt. She had a brief exchange with Syrian Foreign Minister Walid Moallem during the event's luncheon. Last week, Mr. Feltman met with the Syrian ambassador to Washington, Imad Moustapha. The decision to send the two envoys was apparently made soon after that meeting, but Mrs. Clinton waited to announce it after briefing the Israeli government first. "In consultation with our friends and allies, our partners, we are reaching out to determine what, if any, areas of cooperation and engagement are possible," she said Monday. • Joshua Mitnick contributed to this report from Tel Aviv. Clinton sends two US officials to Damascus, says two-state solution "inescapable"
Visiting US secretary of state Hillary Clinton detached two officials from her delegation in Jerusalem for a visit to Damascus "to explore some bilateral issues." Tuesday, March 3. They are the State Department's top Middle East official, Jeffrey Feltman, and Dan Shapiro from the White House national security council. In her meetings with Israel leaders, she pledged "everything we can to ensure Israel's security now and into the future" and repeated her warnings that rocket attacks from Gaza "must cease." She also said she shared "Israel's concern about Iran's pursuit of nuclear weapons and continued financing of terrorist organizations." There is no time to waste, said Clinton, before engaging the Palestinians and achieving a stable ceasefire in Gaza which is only possible of the rocket fire stops. It is our assessment that eventually, the inevitability of working towards a two-state solution is inescapable,” she said. But she also assured that any possible differences of opinion on that vital issue with any Israeli government would not harm the friendly relations and "fundamental alliance" the US and Israel shared. The Palestinian state envisioned by President George W. Bush will get short shrift from Israel's designated prime minister Binyamin Netanyahu when they meet in Jerusalem Tuesday. Netanyahu has spoken of Palestinian self-government but shied away from saying he would back a two-state solution to the Middle East conflict. He is not averse to talking to the Palestinians, but will emphasize that Iran is blocking the Palestinian and all other Middle East issues. Therefore dealing with Tehran is the overriding priority. Netanyahu will also stress that Iran is utterly determined to attain a nuclear bomb and will not be deterred by sanctions. There is no objection to dialogue with Tehran - as President Barack Obama has proposed – as long as a strict time limit is set so as to draw a line on Iranian procrastination and deceit. After her talks with President Shimon Peres, Clinton met foreign minister Tzipi Livni. She also had talks with defense minister Ehud Barak and dined with outgoing prime minister Ehud Olmert. Wednesday she visits Ramallah for talks with Palestinian Authority chairman Mahmoud Abbas and prime minister Salam Fayyad. WASHINGTON: The United States is sending its first ranking government delegation in four years to Damascus before the weekend to sound out the Syrians on ways to improve relations, a State Department official said Tuesday. State Department spokesman Gordon Duguid said Tuesday that Assistant Secretary of State Jeffrey Feltman and Dan Shapiro of the National Security Council would remain behind when Secretary of State Hillary Rodham Clinton leaves the Middle East on Wednesday for Europe. Duguid said Feltman and Shapiro would be the first ranking U.S. officials in the Syrian capital since former Deputy Secretary of State Richard Armitage was there in January 2005. "Do we want to engage with the Syrians? Yes, we do." Duguid said. "Yes, indeed we do." The United States will send two senior administration officials to Damascus this week to work on bilateral ties, U.S. Secretary of State Hillary Clinton said in Jerusalem yesterday, in a further sign of thawing U.S.-Syria relations. "We're going to dispatch a representative of the State Department, a representative of the White House, to explore with Syria some of these bilateral issues," Clinton said, announcing another step that could help Damascus improve its standing in the West after years of tensions. The move comes after several years in which top American officials have avoided going to Damascus. "We have no way to predict what the future with our relations concerning Syria might be," she told a news conference with Foreign Minister Tzipi Livni. U.S. officials said the two emissaries would be Jeffrey Feltman, a former U.S. ambassador to Lebanon and now acting assistant secretary of state for Near Eastern affairs, and Dan Shapiro of the White House's National Security Council. Shapiro and Feltman, who is known to be a harsh critic of Syria, will head to Damascus after visiting Beirut this week, where they are scheduled to meet with Lebanese President Michel Sleiman and Prime Minister Fuad Siniora. The trip is designed to show Syria that the United States expects Damascus to refrain from intervening in the Lebanes parliamentary election in June. The administration of U.S. President Barack Obama has been reviewing American policy toward Syria, including whether to return an ambassador to Damascus, a move the former Bush administration had been considering in the final months in office. The United States will send two officials to Syria soon for "preliminary conversations" which could mark the beginning of a thaw in the three-year-old freeze in relations between the two countries. Hillary Clinton, the new US Secretary of State, who briefly met the Syrian Foreign Minister, Walid al-Moallem, in Egypt on Monday, announced the decision to send an official delegation to Damascus after meeting the Israeli Foreign Minister, Tzipi Livni, in Jerusalem. She told a news conference: "We have no way to predict what the future with our relations concerning Syria might be. There has to be some perceived benefit of doing so for the United States and our allies and our shared values. But I think it is a worthwhile effort to go and begin these preliminary conversations." Shortly afterwards, the US embassy announced in Damascus that Jeffrey Feltman, the top State Department official dealing with the Middle East, would head the delegation, and said that the visit was intended to build on his "substantive and constructive" meeting last month with Syria's ambassador in Washington, Imad Moustapha. The Bush administration pulled its ambassador out of Damascus in 2005 in protest at Syria's strongly suspected role in the assassination of the former Lebanese prime minister, Rafik Hariri. The US has previously accused Syria of not doing enough to prevent foreign fighters from crossing its border into Iraq and, like Israel, heavily criticised it for supporting militant groups such as Hizbollah and Hamas. Mrs Clinton – while pledging Washington's "unrelenting" support for Israel's security – also warned that pursuit of a two-state solution to the Israeli-Palestinian conflict was "inescapable". Although she emphasised that the US would work with whatever Israeli government emerged from negotiations this could be read as a warning to Prime Minister-designate Benjamin Netanyahu who has so far refused to sign up to the notion of a Palestinian state. Ms Livni has for far resisted overtures to join a Netanyahu government on precisely those grounds. But the Likud leader, after meeting Mrs Clinton, insisted that the two politicians had found "a common language". Hillary Clinton announced yesterday that Washington will send two senior officials to Syria for "preliminary conversations", in an apparent sign of a new softening of US policy. The US secretary of state, who was meeting Israeli leaders in Jerusalem, said she could not predict where the talks would lead. But she added: "We don't engage in discussions for the sake of having a conversation. There has to be a purpose to them, there has to be some perceived benefit accruing to the United States and our allies." US officials said Jeffrey Feltman, the state department's top Middle East diplomat, would travel to Damascus along with Dan Shapiro of the White House's national security council. Last week Feltman met for nearly two hours with the Syrian ambassador to Washington, the highest-level contact between the countries since the start of the Obama government. Washington recalled its ambassador to Damascus in 2005, after the assassination in Beirut of former Lebanon prime minister Rafiq al-Hariri. But Obama's administration has been reviewing its policy to Syria and is considering whether to send an ambassador once again. On Monday, at a conference to raise aid for the Palestinians in Egypt, Clinton shook hands and spoke briefly with the Syrian foreign minister, Walid al-Moallem. Clinton's announcement came after she met with Israel's foreign minister, Tzipi Livni. She also met Israeli president Shimon Peres and was due to meet the opposition leader and probable next prime minister, Binyamin Netanyahu, as well as current prime minister Ehud Olmert. Clinton said on Monday that she wanted to pursue peace between Israel and the Arab world on "many fronts", suggesting she might encourage Israel and Syria to talk. Some Israeli figures believe an agreement with Syria might be easier to achieve than a peace deal with the Palestinians. However, Netanyahu has appeared to rule out negotiations with Syria, in refusing to give up the Golan Heights, which Israel captured from Syria in 1967. Netanyahu, who is likely to lead a narrow, rightwing government, has also stopped short of endorsing a two-state solution to end the conflict between Israel and the Palestinians. Clinton said that an independent Palestinian state was now "inescapable", which may put the new Israeli government at odds with the US administration. Clinton said a two-state deal was in "Israel's best interests". "The United States will be vigorously engaged in the pursuit of a two-state solution every step of the way," she said. "The inevitability of working toward a two-state solution is inescapable." She made no criticism of Israel at a time when, three weeks after elections, the new government is still being formed, and offered "unrelenting" support for Israel's security. She again spoke out against rocket attacks by Palestinian militants in Gaza and said there could not be a "durable ceasefire" while militant attacks continued. "There is no doubt that any nation, including Israel, cannot stand idly by while its territory and people are subjected to rocket attacks," she said. Clinton will meet Palestinian president Mahmoud Abbas and prime minister Salam Fayyad in the occupied West Bank tomorrow. Israeli officials were keen to talk to Clinton about Iran's nuclear ambitions, which Israel regards as one of the key challenges in the region. The Ha'aretz newspaper said officials would present Israel's "red lines" on any talks between Washington and Tehran. It said Israel would ask for tougher sanctions while any dialogue takes place and for an action plan to be put together by the US with Russia, France, Germany and Britain to decide in advance how to act if the talks failed. Israel also wants a time limit on the talks, it said. Clinton said the US would consult with Israel on its approach to Iran. "When we talk about engagement with Iran, do not be in any way confused. Our goal remains the same: to dissuade and prevent Iran from acquiring nuclear weapons and continuing to fund terrorism," she said. "Whatever we do will be done thoughtfully in consultation with our friends and Israel, most particularly Israel." Hillary Clinton, US secretary of state, said yesterday that the US would dispatch two senior diplomats to Syria for negotiations this week, in the clearest break yet with Washington's previous policy of isolating Damascus. The move reflects the US desire to weaken Syria's relationship with Iran, help stabilise Iraq and foster a better climate for a possible new round of peace talks between Damascus and Israel. The announcement was made during Mrs Clinton's first visit to Israel since taking office in January. "We have no way to predict what the future with our relations concerning Syria might be . . . But I think it is a worthwhile effort to go and begin these preliminary conversations," she said. Mrs Clinton did not provide details of the agenda of the talks. But the decision to open a new channel of communications with Damascus marks a departure from the confrontational approach that characterised US-Syrian relations under George W. Bush. The former US president repeatedly attacked Syria as a sponsor of terrorism. In 2005, he recalled the US ambassador from Damascus following the assassination - widely blamed on Syrian agents - of former Lebanese prime minister Rafiq Hariri. Mr Bush also refused to back a high-profile attempt by the outgoing Israeli government to forge a peace deal with Syria. Some Israeli diplomats believe his administration's stance in effect pushed Syria closer to Iran. Analysts argue that Syria has little interest in striking a peace agreement with Israel that does not bind in the US as well. Direct talks between Washington and Damascus may therefore help remove a key obstacle to restarting talks between Syria and Israel, which were put on hold last year. The two emissaries will be Jeffrey Feltman, the top state department official dealing with Middle East policy, and Dan Shapiro, a member of the White House National Security Council. Last week, Mr Feltman received Syria's ambassador to the US at the state department, so ending years of isolation. In an earlier sign of thawing US-Syria relations, John Kerry, chairman of the Senate foreign relations committee, last month visited President Bashar al-Assad in Damascus. "I was very encouraged by what I heard," Mr Kerry told CNN, saying the two men had discussed Iran, Iraq Lebanon and the presence of Hamas in Damascus. Speaking after her meeting with Tzipi Livni, Israel's foreign minister, Mrs Clinton sought to allay Israeli concerns over Iran, saying "we intend to do all we can to deter and prevent Iran from obtaining nuclear weapons". She also promised the US administration would consult Israel before holding direct talks with Tehran, an element of Mr Obama's new foreign policy that has aroused suspicion among several Israeli policymakers. Mrs Clinton later met Benjamin Netanyahu, Israel's prime minister-designate and an opponent of moves to establish an independent Palestinian state. While she stressed the new US administration would work closely with any Israeli government, Mrs Clinton reiterated the US's commitment to a two-state solution as the "inevitable" way to resolve the Israeli-Palestinian conflict. JERUSALEM, March 3 -- The United States is moving quickly to revive relations with Syria, sending two senior officials to Damascus this weekend to explore how the two countries can move beyond years of bitterness over the U.S.-led invasion of Iraq and Syria's links to terrorist groups. Secretary of State Hillary Rodham Clinton announced the dispatch of State Department and White House envoys during a visit to Israel, where an incoming government is hostile to the idea of a Palestinian state but may show more interest in a peace agreement with Syria. "There has to be some perceived benefit of doing so for the United States and our allies and our shared values," Clinton said Tuesday at a news conference after talks with Israeli Foreign Minister Tzipi Livni. "But I think it is a worthwhile effort to go and begin these preliminary conversations." A rapprochement between the United States and Syria has the potential to reshape the Middle East if it results in Syria curtailing its ties to Iran and anti-Israeli militant groups in exchange for return of the Golan Heights, which Israel seized during the 1967 Arab-Israeli war. In the past year, Syrian President Bashar al-Assad has indicated he wants to end Syria's diplomatic isolation, holding indirect talks with Israel and welcoming French President Nicolas Sarkozy to Damascus. The U.S. emissaries will be Jeffrey D. Feltman, acting assistant secretary of state for near eastern affairs, and Dan Shapiro, the senior official for the Middle East on the National Security Council staff. They have been traveling with Clinton in the Middle East and will arrive in Damascus this weekend. Officials traveling with Clinton declined to provide details on what the envoys hoped to accomplish, except to say it was a sign of President Obama's desire to engage with other countries. Feltman held a two-hour meeting Thursday at the State Department with the Syrian ambassador to the United States. Previewing one area of potential conflict with the incoming Israeli government, Clinton said she believed "the inevitability of working toward a two state-solution is inescapable" and the administration "will be vigorously engaged" in trying to create a Palestinian state. Prime minister-designate Binyamin Netanyahu, who is attempting to form a government, has expressed deep skepticism about the concept, preferring to focus on building up the Palestinian economy. The United States has not had an ambassador in Syria for four years, since the Bush administration withdrew Margaret Scoby after the 2005 assassination of former Lebanese prime minister Rafiq al-Hariri, which many Lebanese blamed on Syria. Syrian officials denied any role in the killing. Syria had long regarded Lebanon as a vassal, but Lebanese outrage over Hariri's killing prompted a popular movement known as the "Cedar Revolution" that led to the departure of Syrian troops from Lebanese soil. U.N. investigators have implicated Syrian officials in the Hariri attack. The Bush administration also faulted Syria for allowing fighters to cross its border into Iraq, and for hosting exiled leaders of Hamas, an Islamist Palestinian movement that Israel and the United States consider a terrorist organization. Relations between the two countries remained largely frozen, though then-Secretary of State Condoleezza Rice held two inconclusive meetings with her Syrian counterpart in 2007 and 2008. Feltman brings an unusual history to the diplomatic mission. As ambassador to Lebanon during the 2005 Cedar Revolution, his efforts to foster a government independent of Syrian influence so angered the Syrian government that at one point, State Department security officials were concerned that Damascus had ordered his assassination. 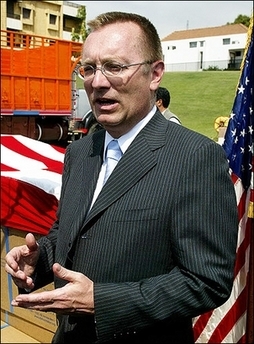 Shortly before he returned to Washington, in January 2008, an embassy convoy was attacked in a car bombing that killed three Lebanese civilians and injured dozens of people; Feltman was traveling in another convoy and was not injured. In Damascus, Clinton's announcement was greeted as tangible evidence that Syrian-U.S. relations will improve. "It is obvious that this administration realizes that the deterioration of the relations between Syria and the U.S. was caused by the lack of dialogue, and it also realizes what such a dialogue could mean in terms of the stability and peace of the region," said Elias Murad, editor in chief of al-Baath newspaper. "The authorities here are relaxed. They think Obama has sent a number of positive and eager messages," said Thabet Salem, another Syrian journalist, citing the appointment as Mideast special envoy of former senator George J. Mitchell, whose previous work with Israelis and Palestinians has been seen by Arabs as even-handed. "The region is also changing -- if there is no American occupation in Iraq, much of the tension will also go away." Last year, Israel held indirect talks with Syria, brokered by Turkey, in an effort to see if a peace agreement could be reached. Syria is seeking the return of the Golan Heights, while Israel wants Syria to end its support of militant groups. During the administration of President Bill Clinton, Syria and Israel nearly reached a peace deal, but they could not agree on the last 50 meters, or about 160 feet, of land. Yigal Palmor, spokesman for the Israeli Foreign Ministry, expressed some doubt about whether pursuing the Syrian track would bear fruit. He noted that the Turkish-sponsored talks were only to determine the conditions for beginning actual peace talks, and that Syrian officials refused to meet directly with Israeli envoys. "It was very telling," Palmor said, saying Syria's stance in the past year was similar to the stance of militant groups such as Hamas and Hezbollah. "It is very important for them to never deal directly with Israel." Special correspondent Alia Ibrahim in Beirut contributed to this report. Hillary Clinton made her Jerusalem debut as secretary of state Tuesday - and immediately signaled a new diplomatic push to reopen relations with Syria. Clinton said two American envoys would soon hit the road to Damascus, marking the first direct, high-level talks between the U.S. and Syria since 2005, when relations broke down over Syria's support of terrorist groups. "We have no way to predict what the future of our relations with Syria might be," Clinton said. "I think it is a worthwhile effort to go and begin these preliminary conversations." Officials later said that National Security Council official Dan Shapiro and Acting Assistant Secretary of State Jeff Feltman would head to Syria to get the diplomatic ball rolling. Syria has long harbored Palestinian terror groups, including Hamas, which Clinton sharply criticized for endangering the lives of innocent Israelis and Palestinians and undermining the well-being of the people of Gaza. But Syria is also viewed as a potential ally against Iran's nuclear ambitions - a top diplomatic priority for the Obama administration. "Iran's pursuit of the nuclear weapon is deeply troubling to not only the U.S. but many people throughout the world," Clinton later told ABC News. Throughout her day, Clinton unequivocally expressed the administration's plans to pursue peace in the Middle East - a peace, she suggested, that hinged on the creation of an independent Palestinian state. "The inevitability of working towards a two-state solution seems inescapable," Clinton told reporters in Jerusalem. That could put the White House at odds with incoming Israeli Prime Minister Benjamin Netanyahu, who opposed the creation of a Palestinian state in his recent election campaign. But Netanyahu said after an hour-long sitdown with Clinton that the two had found "common ground" and pledged continued cooperation. The former First Lady later visited the Yad Vashem Holocaust memorial, where she laid a wreath in the memorial hall honoring the memory of the six million Jews killed by the Nazis. "My visit," Clinton said, "was a powerful reminder of why we are working so hard to advance the security of the State of Israel." Washington is dispatching two senior US diplomats to Damascus for "preliminary conversations" on bilateral and regional issues, US Secretary of State Hillary Clinton announced Tuesday, in what would be the highest-level visit by US officials in four years. "We are going to be sending two officials to Syria," Clinton said at a Jerusalem press conference after meeting Foreign Minister Tzipi Livni. "There are a number of issues we have between Syria and the United States, as well as larger regional concerns that Syria obviously poses," she said. The delegation - Jeff Feltman from the State Department and Dan Shapiro from the White House - would go to explore these "bilateral issues" with Syria, she said. She added that the US had "no way to project what the future of our relations with Syria might be." Clinton said the discussions were not for the "sake of conversation," but that there "has to be a purpose for them and some perceived benefit accruing to the US and our allies and our shared values." Feltman and Shapiro are currently traveling with Clinton, and according to State Department deputy spokesman Gordon Duguid, they will travel to Damascus before Saturday. Feltman met Syria's ambassador to the US Imad Mustafa last week in Washington, and on Monday, during the Gaza Strip reconstruction conference in Sharm e-Sheikh, Clinton stopped briefly and shook hands with Syrian Foreign Minister Walid Muallem. The US recalled its ambassador from Damascus in 2005 as a protest of Syria's alleged role in the assassination of former Lebanese prime minister Rafik Hariri. Duguid, speaking at the State Department's daily press briefing in Washington, said Feltman and Shapiro would be the highest-level US administration officials to visit Syria since 2005. Since then, however, a number of senators and congressmen have visited there, the most recent being Senate Foreign Affairs Committee chairman Sen. John Kerry last month. Zalman Shoval, one of Prime Minister-designate Binyamin Netanyahu's top foreign policy advisers, said he was not aware that the matter of Syria had come up in Netanyahu's conversation with Clinton. Shoval said he thought the dispatching of the two to Damascus was not meant to facilitate an immediate détente between Syria and the US, but to sound out Syria about ending support to Hamas and Hizbullah. "This seems to be a fact-finding mission, not a gesture," Shoval said, adding that the Netanyahu camp had serious doubts about Syria's ability or willingness to disconnect from Iran. Clinton, referring to a possible Israeli-Syrian diplomatic track, said this would be a matter on the agenda once a government was established in Israel. Netanyahu has expressed skepticism in the past about being able to reach any agreement with Syria, because of a belief that Damascus would be unable to break ties with Teheran. JERUSALEM—The Obama administration is dispatching two U.S. officials to Damascus for exploratory talks with the regime of Syrian President Bashar Assad, Secretary of State Hillary Clinton said Tuesday in a new signal of the White House's determination to reach out to longtime adversaries. Clinton, in Jerusalem for her first talks with Israeli officials, described the upcoming meetings as "preliminary conversations" intended to probe whether the Syrian government is serious about a new relationship with the United States. She told reporters in a news conference with Israeli Foreign Minister Tzipi Livni that while the outcome is uncertain, "it is a worthwhile effort to go and begin" the talks. The U.S. officials are Jeffrey Feltman, the acting U.S. secretary of state for the Middle East, and Daniel Shapiro, the ranking official for the Middle East at the National Security Council and former Mideast adviser to the Obama presidential campaign. Feltman is a former U.S. ambassador to Lebanon. The two men will leave this weekend for Damascus for a series of meetings expected to last a few days. Because the talks are preliminary, they're not expected to meet Assad. The administration of President Barack Obama— who campaigned on a promise of outreach to adversaries— also plans an overture to Iran, and Clinton has appointed a high-level envoy to advise her on U.S. policy toward Tehran. Administration officials see the possibility of a new relationship with Damascus as part of a strategic realignment in the region. A shift could dilute Syria's relationship with Iran, weaken the Syrian-supported Hezbollah and Hamas militant groups and make it easier for Israel to reach a peace settlement with Palestinians, they believe. At an international conference Monday in Egypt, Clinton said U.S. officials were interested in "comprehensive" Mideast talks—a signal that the Syrians should be involved. A thaw with Damascus would reverse the policy of the Bush administration, which withdrew its ambassador to Syria in 2005 after the assassination of former Lebanese Prime Minister Rafik Hariri, which was blamed on pro-Syrian officials. But an opening to Syria also holds risks for the United States. In Lebanon, moderate political groups have expressed concern that their interests could be sacrificed by the U.S. effort. For example, they fear the possibility of U.S. compromise on the international tribunal investigating the slaying of Hariri, which could ease pressure on Damascus. The White House has sought to reassure the Lebanese by supporting the country's sovereignty and by adding $6 million in support for the tribunal. Israel began indirect talks with Syria through Turkish mediators last year, hoping they would lead to negotiations on a peace treaty. Outgoing Prime Minister Ehud Olmert said in December that Syria "wants to reconnect with the West." Prime Minister-designate Benjamin Netanyahu, who is struggling to form a new unity government, explored the option of a new relationship with Syria when he headed the government in the late 1990s. However, before the most recent elections, Netanyahu declared his opposition to moves that would be at the heart of any deal, such as giving up the Golan Heights region, captured in the 1967 Middle East War. Some experts doubt that Syria ultimately would agree to a deal with the United States. David Schenker, a former Pentagon Mideast expert now at the Washington Institute for Near East Policy, said that a tie to the United States would mean ending Syria's 30-year bond with Iran that has been a pillar of economic and military support for the Assad regime. Hillary Clinton, the US secretary of state, began her first round of Middle East diplomacy yesterday by promising to pursue peace between Israel and the Arabs on "many fronts" as an international conference raised pledges of more than $4bn in aid to the Palestinians. Clinton spoke at the donors' conference at the Egyptian resort of Sharm el-Sheikh, where the Palestinian Authority was seeking a huge aid injection, partly for reconstruction in Gaza in the aftermath of Israel's three-week war. Egypt's foreign minister, Ahmed Aboul Gheit, said donors had pledged $4.48bn (£3.2bn) in funding to be spent in the next two years. It was "beyond our expectations", he said. Other previous but undelivered pledges were recommitted, bringing the total promised to $5.2bn - nearly double what the Palestinians had sought. However, it is still unclear how much reconstruction can take place in Gaza while Israel continues its blockade, which prevents the import of materials such as concrete, glass and metal. Ban Ki-moon, the UN secretary general, said the situation at the Gaza crossings was "intolerable" and called for them to be opened. He also said it was essential that illegal weapons did not enter Gaza. Clinton promised to "vigorously" pursue a two-state peace agreement between Israel and the Palestinians, and her mention of peace on other fronts suggested the Obama administration may also push for a deal between Israel and Syria. Later she shook hands and spoke briefly with the Syrian foreign minister, Walid al-Moallem - an unscheduled meeting that perhaps suggested warmer relations were coming. Washington recalled its ambassador to Damascus three years ago. Clinton said the US would pledge $900m to the Palestinians, subject to approval by Congress, but warned of tight supervision of how the money would be spent. Although she did not mention Hamas she spoke forcefully against extremism and condemned the continuing firing of rockets into southern Israel. "We have worked with the Palestinian Authority to install safeguards that will ensure our funding is only used where and for whom it is intended and does not end up in the wrong hands," she said. "It is time to break the cycle of rejection and resistance, to cut the strings pulled by those who exploit the suffering of innocent people." Clinton made no reference to the closure of the Gaza crossings, or to Jewish settlements in the occupied West Bank, which are a prime concern for the Palestinians. Today she will meet Israeli leaders, including foreign minister Tzipi Livni and Binyamin Netanyahu, the rightwing Likud leader who will form the next government. Livni's Kadima party decided yesterday to go into opposition, making it ever more likely Netanyahu will head a narrow rightwing coalition that may find itself at odds with the US administration.